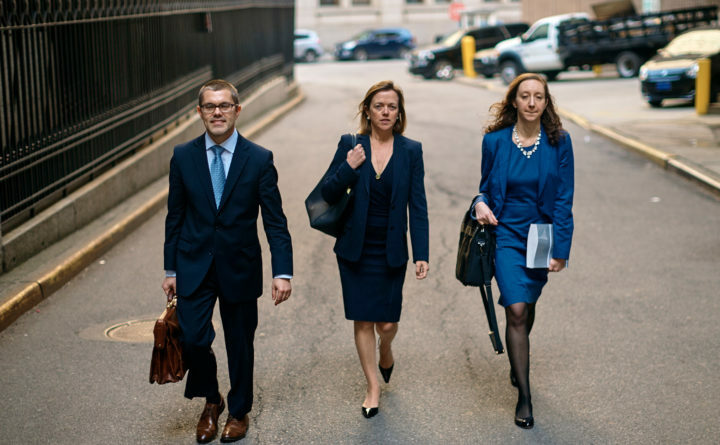 Attorney Joanna Hendon representing President Trump, center, leaves the federal court, Friday, April 13, 2018, in New York. U.S. District Judge Kimba Wood shot down President Donald Trump's personal attorney, Michael Cohen's request for a temporary restraining order related to the judicial warrant that authorized a search of his Manhattan office, apartment and hotel room this week. NEW YORK — President Donald Trump and his personal lawyer, Michael Cohen, lost their battle to block investigators from looking at records seized during a federal raid of Cohen’s office and home before they had a chance to review them. Cohen and Trump’s legal teams said that many of the seized materials were communications that were private and fell under attorney-client privilege. Cohen’s team in court — and in an earlier filing Monday morning — called on Wood to appoint an independent party known as a “special master” who could review the seized communications and excise ones that were privileged. Prosecutors said that there was no need for a special master, stating that they have “a taint team” dedicated to determining which of Cohen’s communications are privileged. Ones that are not privileged would be passed along to the public corruption unit. However, trying to find compromise with the three parties, Wood indicated that she may appoint a special master to assist prosecutors when they begin sifting through files after a taint team review. Cohen’s appearance in court on Monday became a media circus — attracting not only a scrum of reporters to the court but X-rated actress Stormy Daniels, former Trump aide Carter Page and even former Gov. Elliot Spitzer. Trump’s longtime loudmouth consigliere stayed silent for the most part as he passed a fray of reporters hoping for comment. “There are three parties in this case. Only two of them have made public comments about the searches,” McKay said.